One cinema-architecture responds to another as the nineteenth-century mansion of the heiress to the Winchester Repeating Rifle fortune haunts once again through the hallucinated images of American artist Jeremy Blake’s Winchester Trilogy. Blake’s invention of a new genre of art between video and painting—video projection as time-based painting–is the medium through which arah Winchester’s mad architectural project (constructed to appease spirits killed by her family’s manufacture) transmits its ghostly inheritance. 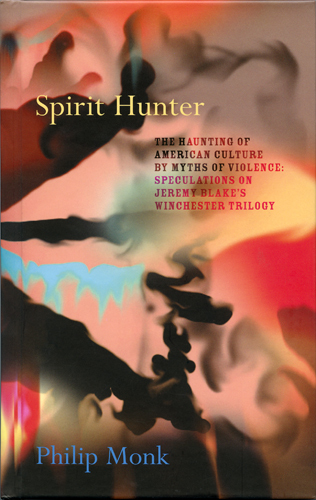 Spirit Hunter examines how its mythic haunting by violence reverberates today in America’s wars. The book ranges widely through frontier myth, American foreign policy, technology, war, film history, psychoanalytic theory (Nicholas Abraham and Maria Torok’s cryptonymy), and philosophy (Jacques Derrida and Emmanuel Levinas), as it weaves art analysis into the troubled history of a social artifact. As Blake tells his story purely through images issuing as haunting from the architecture of Winchester house, Spirit Hunter pursues its speculation on the secrets Sarah Winchester shielded through her fabled mansion into the image itself to question whether she was hostage to her haunting or to national myth.